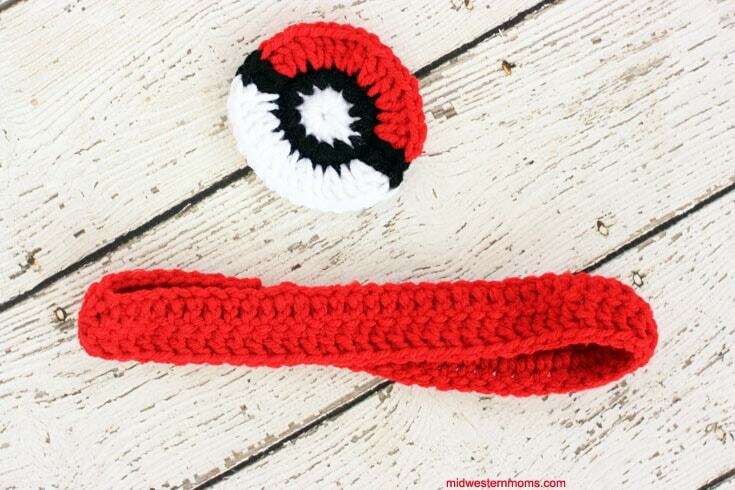 The perfect crochet headband pattern for the Pokemon fan! 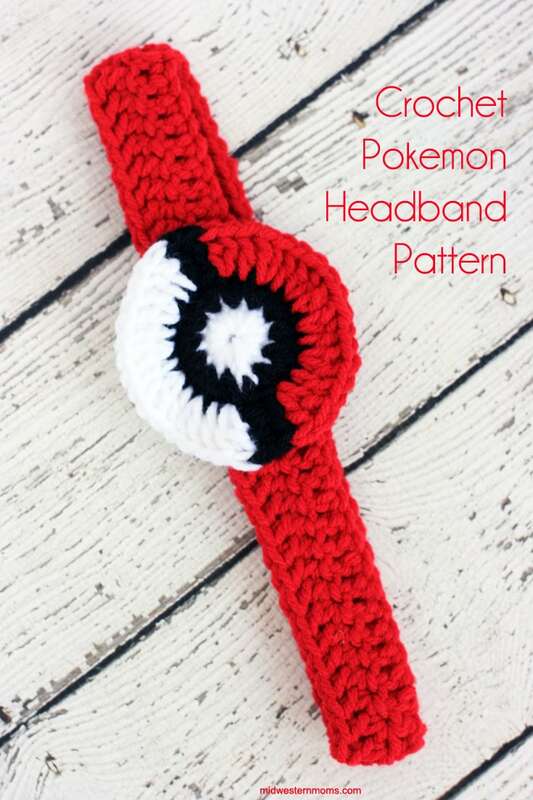 This crochet Pokemon headband pattern is an easy pattern and can be made quickly. After making the Pokeball coasters, I decided a simple crochet Pokemon headband would be cute! When making this headband, I was thinking of my niece. She loves going on walks with her parents and playing Pokemon Go! It is awesome how the Pokemon Go craze has helped so many people get out and walk around! I am included in this! It has definitely helped me get out. Got to hatch those eggs! For the headband pattern, I took the coaster pattern and modified the Pokeball to be smaller for a headband. I thought it turned out pretty cute and I think my niece will love it! She is having a birthday soon, so it is a perfect gift! I used the same measurements as in my flower headband pattern for the band. I used black yarn to sew the Pokeball onto the band. That way it is hidden where it is sewn. 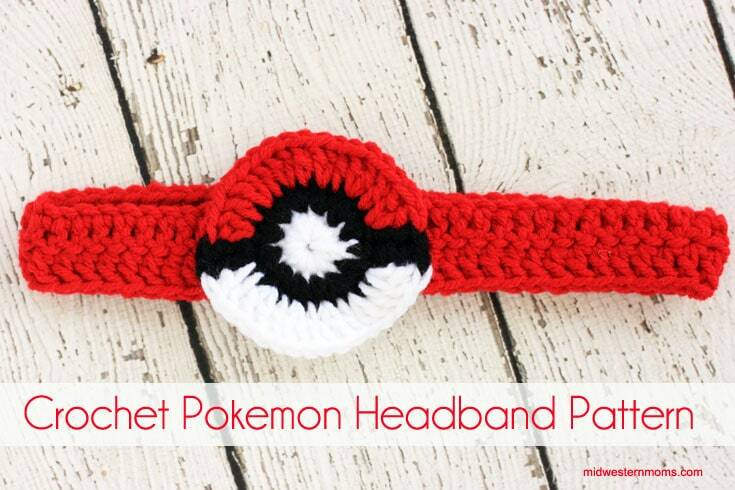 Place the Pokeball on the headband where your want it and sew it on. Printable Pattern at bottom of post. Round 1: (White Yarn) Starting with the Magic Circle, single crochet 12 stitches. Tighten your circle and slip stitch to join. Cut your yarn. Round 3: Chain 2. Double crochet once in the next stitch. Change your yarn to RED. *Double crochet twice in the next stitch then once in the next. * Repeat this pattern until you have 16 red stitches. Change your yarn to BLACK. Double crochet once in the next 2 stitches. (2 black stitches) Change your yarn to WHITE. Double crochet in the same stitch as the last black double crochet. *Double crochet twice in the next and once in the next. * Repeat this pattern until you have 16 white stitches. Slip stitch to join. Weave in all your ends. Row 1: Chain the amount you need to make the length you need, then add 2 chains. Double crochet back. Chain 2 and turn your work. Row 2: Double crochet back across. Cut your yarn but leave a long tail for sewing together your headband. Sew the ends of the headband together to make a round band. To get a printable version of this crochet pattern, simply put your email in the newsletter box below. An email will be sent to you with a link to print the pattern. thank you for pattern. my granddaughter will love it. hope to make it tonight. Love the headband!! Thank you! !